↴ Kenwood TM-221A 2 meter mobile transceiver was specifically designed to condense maximum performance and operating convenience into an ultra-compact package. There are 14 multi-function memory channels plus 2 odd split channels. The TM-221A transmits on 2 meters with 45 or 5 watts. ↱ Extended receive allows reception from 138 to 174 MHz. You also get built-in CTCSS encode and an easy to read LCD. The rear panel has a large heatsink, a pig-tail inline SO-239 jack and mini speaker output jack. Supplied with MC48B DTMP microphone. ⬄ The Kenwood TM-321A transmits on 220 MHz with 5 or 25 watts. 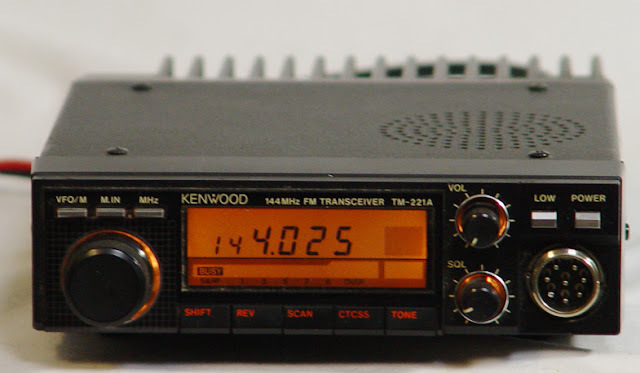 ⬄ The Kenwood TM-421A transmits on 440 MHz with 5 or 35 watts. ⬄ The Kenwood TM-521A transmits on 1240 MHz with 1 or 10 watts.